Fill out an application at Circulation or print out a completed application form and bring it with you to the Library. Photo ID with current address OR photo ID and another document that shows proof of address (electric bill, lease agreement, car registration, etc.) must be presented at time of application. Individuals ages 14 and under require parental permission. Checkout limits are subject to residency requirements. 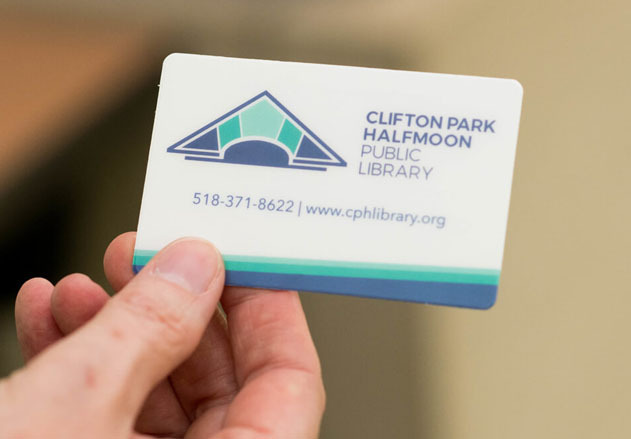 You may use your card at the Clifton Park-Halfmoon Public Library and at any library in the following counties, subject to individual library policies: Fulton, Hamilton, Montgomery, Saratoga, Schenectady, Schoharie, Washington, and Warren Counties. Instructions to manage your account online.